In the last article we shared the main tips and information about the Cisco X2 and SFP compatibility. We also listed several question about the X2 and SFP asked by Cisco users. After you have read the main data sheet of Cisco 10GBASE X2 Module, it’s easy for you to solve the problem of the Cisco 10GBASE X2 modules’ support. Way One: As the LX4 is not supported in a Cisco SFP+ footprint, you will need to change out the optics in your core switch to be compatible with a module compatible in the 8510. So select the SFP-10G-SR, and purchase a SC-LC fiber cable to connect each other. Way Two: If you choose the CVR-X2-SFP10G, you also need to buy other two SFP-10G-SR.
…And what is the CVR-X2-SFP10G? So in the following part we will introduce you the CVR-X2-SFP10G and the CVR-X2-SFP10G=. They are Cisco OneX Converter Module? Who is the Cisco OneX Converter Module? The Cisco OneX Converter Module offers investment protection for 10 Gigabit Ethernet X2 ports of Cisco switches by enabling migration from X2 to Small Form-Factor Pluggable Plus (SFP+) form factor without having to upgrade the switches or modules. The OneX Converter Module converts a 10 Gigabit Ethernet X2 port into a 10 Gigabit Ethernet SFP+ port. With the OneX Converter Module, customers have the flexibility to use the 10 Gigabit X2 interface port of a switch with X2 modules or SFP+ modules. This flexibility is critical when the specific type of interface is not available in one or the other form factor or when customers want to use the same form factor for interfaces across multiple platforms deployed in their network. 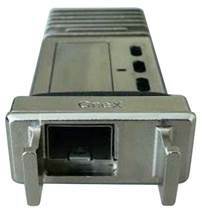 The list of switch models supporting the OneX Converter Module can be found in the 10 Gigabit compatibility matrix at https://www.cisco.com/en/US/docs/interfaces_modules/transceiver_modules/compatibility/matrix/OL_6974.html. The table below lists The Cisco SFP+ transceiver modules that can be plugged into the OneX Converter Module. Dimensions: Dimensions (D x W x H) are 3.87 inches X 1.65 inches X 0.75 inches (98.3 mm x 41.9 mm x 19.1 mm). The Cisco OneX Converter Module typically weighs less than 0.6 lb (300 g).